When Nate is kidnapped and taken prisoner by the Sea Goddess, only Bertie can free him. She and her fairy sidekicks embark on a journey aboard the Thèâtre’s caravan, using Bertie’s word magic to guide them. Along the way, they collect a sneak-thief, who has in his possession something most valuable, and meet The Mysterious Stranger, Bertie’s father—and the creator of the scrimshaw medallion. Bertie’s dreams are haunted by Nate, whose love for Bertie is keeping him alive, but in the daytime, it’s Ariel who is tantalizingly close, and the one she is falling for. Who does Bertie love the most? And will her magic be powerful enough to save her once she enters the Sea Goddess’s lair. Perchance to Dream picks up right where Eyes Like Stars let off. Bertie is traveling with Ariel and the faeries to rescue Nate. 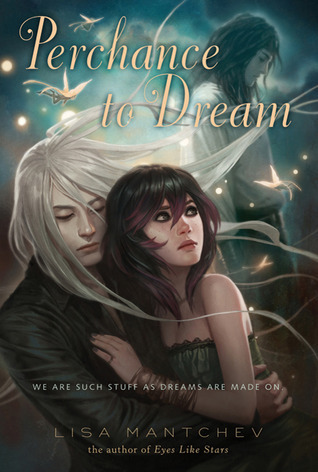 At first, it's a bit disorienting because of the high fantasy aspect, and unless you read Perchance to Dream immediately after finishing Eyes Like Stars, it may take several pages before you're accustomed to the setting and the interesting way Lisa Mantchev weaves her story. I definitely liked this book better than the first one, (and I loved the first one), because I was used to the world and the characters. When reading Eyes Like Stars, I would sometimes get confused as to what was going on or who was what. But with Perchance to Dream, it was all clearer, and I was able to enjoy the story more. The plot is even more intense and endlessly twisting. There are many revelations about Bertie and her past. One of the great things about the way Lisa Mantchev writes is that the real and unreal are blended so seamlessly that sometimes you have to wonder what's really going on in the story. If you read Eyes Like Stars and even so much as remotely liked it, then most definitely pick up Perchance to Dream. I give it 4 out of 5 stars. I would like to read this series. I've seen a few reviews, and I'm really curious now. I love the covers! Great review! I'm really interested in reading this series. I've only read a few fey books so far, but I've loved them all. This series sounds amazing and I'm so intrigued to see this fantasy world Lisa has created!